I have been looking for printable grave stones but in N scale without any success. I have however downloaded yours and printed them on both card and labels and will make my own cutting them down to size, hopefully they will be OK, if not I will fade into the distance without passing any more comments, if I like them I will be posting some photographs later on. Many Thanks Nick, I have been looking at that, and also the scaling. PDF coding is based on the Postscript printer language, it includes at least two ways for handling scaling. Postscript was a plain language printer driver so you could read the output and work out which method had been used where. PDF is encrypted mainly to stop copyright theft so unless you have the original dimensions it's difficult to get the scaling correct, especially as it does fit to page and a host of other settings to make printed documents look pretty. Best bet is to print one and see how much you need to enlarge or reduce it. If your printer offers the choice use the "system dialogue" not the PDF one, it will give you better control of the output, PDF sometimes tries too hard to "help" you. I think what I will do, is a screen print and then I can experiment with it as an image and when it looks right, print it. Lancastrian wrote: I think what I will do, is a screen print and then I can experiment with it as an image and when it looks right, print it. On checking I have noticed that when printing PDF's amongst the options is to set a custom scale, so it's just a case of calculating the correct scale and setting it. Excel here I come and this is what I got 0.513513514. This is for UK ratio of 1:148. How common were the overhanging corners on Edwarian/Victorian corner stores or terraces? There are certainly some, others seem to have a small 45 degree face above the door. Perhaps both would be an option? This will be my last update post this side of Christmas. 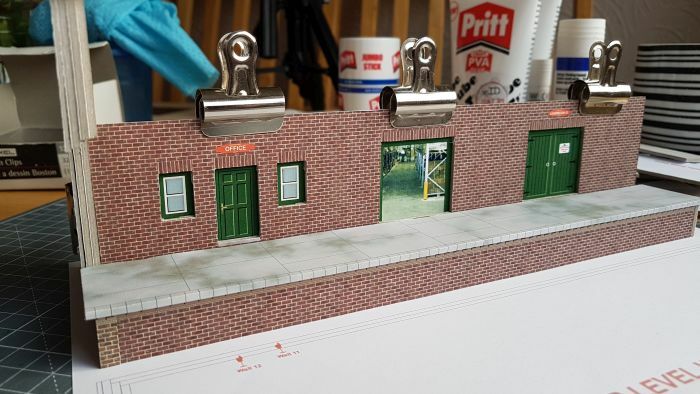 Just gone onto the website is the new Corner Pub Building "The Fying Dutchman", so with thiss addition we have both corners covered ready to create a very good looking town scene. 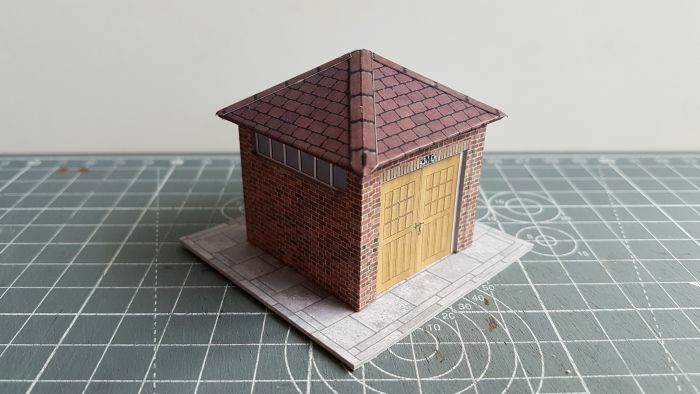 I've been working on my Low relief Bonded Warehouse & have decided a complete rethink is now in order on this kit as it just seemed to be lacking something, so starting fresh means I'm behind the eight ball now as I really need this kit so I can complete the left corner side of my own layout. I have a few days off over Christmas so I hoope to spend most of my spare hobby time on the laptop rather than in the loft. Just in case no more posts I'd like to than everyone for your support & hope you all have a wonderful Christmas & a Happy New Year. And a very happy Christmas to too Mike and thankyou for the prezzie of the shop and pub. 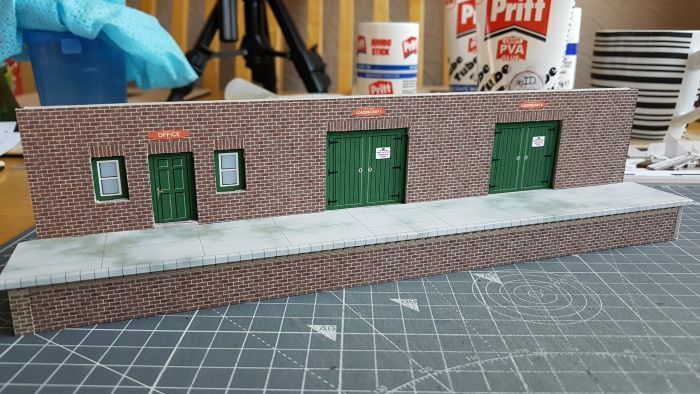 Well we're into 2019 & I thought I'd share a few photo's showing my progress on the Low relief Bonded Warehouse kit. 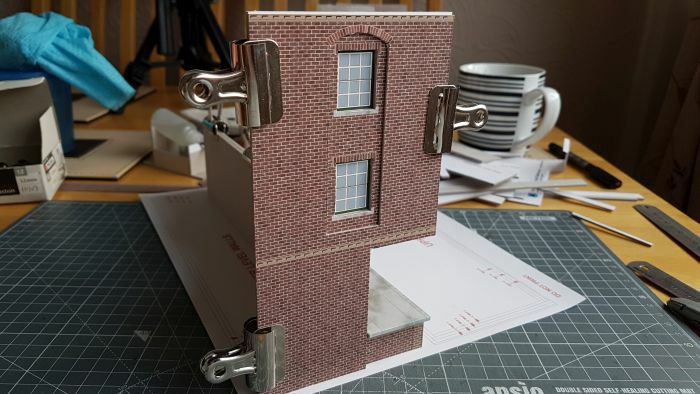 I'm actually at the stage of doing the test build now & with the sections I have built so far only managed a dry test fit so you'll have to forgive the bull dog clips holding thingss together. I've also done an optional version where the doors will be open showing a simulated interior. The first side wall section now tested for visual effect. Trying to give the building so depth around the window area. Still quite a few more sections to build & it is modular so the kit will just duplicate so it can be made longer by addding a second section. I'm also doing so Youtube videos called "Lets build a card kit", the pilot episode showing the portacabin kit went down well. The next episode was building the platform sections, this was requested by many veiwers. I'd like to keep this new theme running so hopefully once a month there should be a new video. This could be an old kit already on the website, or it could be a new build. Well I've been given a surprise day off work so I'm going to complete some steps for my platform sections I'm using here at Wordsworth rather than ramp ends, you never know but I might actually turn these into a kit so others can use this optional extra. Until next time, happy card kit building. Interesting kit. Will have to consider this one sometime down the track. Quick question re St Cuthberts Church. The wall pattern on the Lychgate walls, is it one of your regular brick papers or a special one. The reason I'm asking this is that I want to complete a wall around the church, and I would like to use the same pattern if possible. I can't seem to match the brick/stone wall pattern with your brick paper samples. Also the pattern for capping stones. My layout is HO so I am printing at 87%. Some good news, two new small kits should be available on my website very soon. 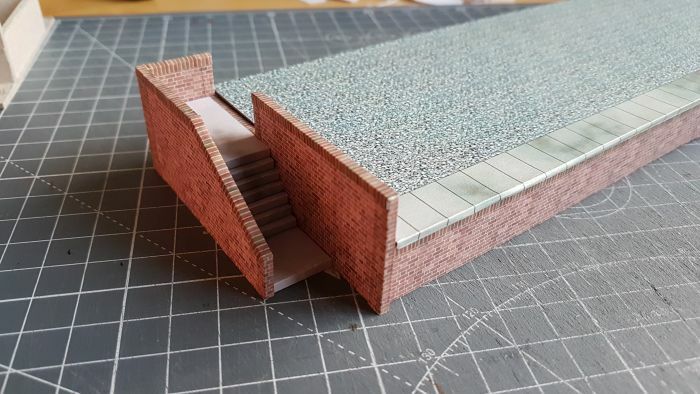 First up in todays preview is the platform end ramp being replaced by some platform end steps, designed to fit either end & have the downward opeing bi directional. Quickly following on the heals of the platform end steps comes the village sub station building, you know what I mean, that tiny square brick struction seen dotted area housing estates. Platform end steps replacing any platform ramp section. New housing estate electrical sub station. Hope you like these new offerings, I certainly do as I need them for my own layout Wordsworth. Don't worry as I'm still working on my low relief bonded warehouse kit, not far from gluing everything together to form the first built section which can then be tested on Wordsworth layout.